Now that Calgary Parking Authority (CPA) has settled the Parkplus parking management system ownership dispute and disclosed some key information (see endnotes), this reporter feels comfortable in sharing an exclusive inside look at one piece of evidence against Mr. Dale Fraser’s ownership claim without risking harm to the city and CPA’s legal case. This key piece of evidence (you can judge for yourself to see if you agree it is “key” or not) was an August 2008 video interview with Mr. Dale Fraser conducted by this reporter. In the extensive August 2008 interview (where Alderman Dale Hodges was also interviewed), a variety of ParkPlus topics (including patents) were discussed. This video evidence was almost “lost” at one point as it was originally uploaded and stored on the now discontinued Google Video service! Fortunately, after some help from a Google engineer friend, the August 2008 interview was recovered along with a few hundred uploaded videos. The video interview was useful enough that Calgary Parking Authority licensed it to help its case which is why I’m claiming this as an “exclusive inside look“. Unlike the parties involved in the legal settlement (Calgary Parking Authority, City of Calgary, Mr. Dale Fraser, and Mr. Allan Bazar), I am an independent reporter and not bound by any confidentiality agreement. During the 30+ minutes interview, at NO point did Mr. Fraser leave this reporter with the impression the pending Canada/US ParkPlus patent was his (or his & Mr. Allan Bazar’s) personal invention or intellectual property. In fact, Mr. Fraser seemed to me quite clear in explaining the system was developed by MTS Allstream with the funds/resources from Calgary Parking Authority. US patent is one of the most important ones to apply for, simply because the US is one of the largest markets and it has a reasonably strong patent protection regime. Here is my 2008 interview video (pay attention to time code ~3:40 to ~3:50). This article is cross-posted by me to examiner. Newly termindated CPA manager Dale Fraser told me, “Calgary Parking Authority did create the proprietary approach to this new parking system. And we [CPA] do have a patent-pending on this approach at this time.” in an August 2008 interview. 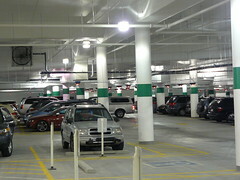 As stated in “The Patents” section in my 2008 August report “ParkPlus by Calgary Parking Authority – Reimagining the Wheels“, I suggested “US patent is one of the most important one to apply for, simply because US is one of the largest market and it has a reasonably strong patent protection regime.“. For those that enjoy reading technical patent, have a read of Mr. Dale Fraser and Mr. Allan Bazar’s US patent application 20100191584. I was fascinated by the Park Assist technology when I first saw the system at Calgary Chinook centre’s new wing. I was told the system, when it is fully deployed, is capable of telling people where a car is parked given its license plate. 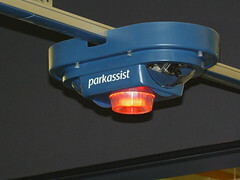 According to Park Assist, its M3 Camera Vision System is “the world’s first single space camera guidance system” (press release). The following are two interesting interviews with Mr. Richard Joffe, Managing Director of Park Assist. 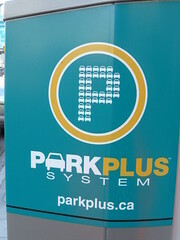 Speaking about parking technologies, feel free to check out “ParkPlus by Calgary Parking Authority – Reimagining the Wheels” for my review of the Calgary ParkPlus system and interview with Calgary Parking Authority General Manager Dale Fraser and Alderman Dale Hodges. P.S. By the way, Park Assist will sometimes make mistake too as you can see in the following photo where the right parking spot is occupied but it still shows green. In my August Reimagining the Wheels article, I blogged in detail (including detailed video interviews) about the ParkPlus System. Now, after only one use of the mobile phone ParkPlus a few weeks ago, I am officially a ParkPlus addict! It takes like 30 seconds or less to activate a parking session. And then when I finished my meeting early, I simply called the system and it automatically credited me the unused time (for $4.95 that day)! So cool! In the old days, I probably would have put in the money for the full maximum two hours and then there is simply no way to get the money back for unused time. But now, mobile ParkPlus puts the money back into my account. Very nice, thank you very much! P.S. Thanks a lot to ParkPlus’ Shelley for setting up a trial account for me. P.P.S. Just found that there are Chinese instructions (together with English) in the Chinatown ParkPlus machines. Really nice. Good job. 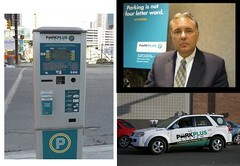 ParkPlus – A Revolution in Parking for Calgary? I’ve written a few too many blogs about political related stuff in this blog space in the last few days. So here is an older one that I had been thinking about writing for ages. I am posting it here for you to read something different and may be closer to the things I usually write about (some technologies, some business, and a bunch of other things all in one post). Hope you enjoy it. 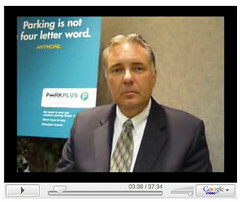 Here is a video of ParkPlus in action! Enjoy.